Have you ever wondered what it would be like to be a participant in the popular television show Shark Tank, or the British version named Dragon’s Den where entrepreneurs pitch their business ideas to a panel of investors? Sixteen students from the North-West University (NWU) and the Vaal University of Technology recently experienced just that. They took part in the NWU’s own version of this competition, Leopard’s Lair. According to project leader FR Bezuidenhout, Leopard’s Lair aims to stimulate student entrepreneurship by supporting their business ideas that can benefit society and lead to job creation. “Leopard’s Lair is a unique entrepreneurship competition where the NWU’s Department of Technology Transfer and Innovation Support and the Faculty of Engineering connect and support students through entrepreneurship and innovation,” he says. Blood, sweat, agony, stress and hard work went into 92 business idea projects which were pitched earlier this year to a panel of academic, industry and business experts. Finally 15 projects were announced as finalists. The final round of the competition took place on the NWU’s campus in Potchefstroom, where participants had the opportunity to pitch their projects to five judges in five minutes. They had to show their mettle to be in the running for prize money to the value of a whopping R100 000 – to be shared among the winner, runner-up and second runner-up. The final round was live streamed on YouTube. Sweaty hands, shivers and shortness of breath were the norm as the finalists entered the interview room filled with lights, cameras and intimidating judges. The finalists did not disappoint and showcased various innovative pitches. These included a mobile app aimed at reducing the high level of graduate unemployment by offering internship opportunities to gain work experience. Another pitch included an events app which allows users to post and view nearby events. One of the contestants pitched an educational website that provides students with academic support in the form of videos, notes, flashcards and mini tests related to the specific course the student is studying. Find-X was another idea where a car tracking device is integrated with a smartphone app, ensuring the device is removed from the car or deactivated should the car be stolen. Even a toilet cleaning device made the final round. This device operates similarly to a dishwasher or washing machine, but is uses hydraulic power and is portable. In the end Boitshepo Gopane, a master’s student in microbiology from the NWU’s campus in Mahikeng, walked away with the spoils. The main aim of her winning project – WeClean Recycling – is to recycle dry waste such as paper, plastic, glass and metals. This is then sorted, repackaged and sold to recycling companies. Boitshepo plans to start her business in the Mahikeng area where she will employ workers to gather dry waste by using customised bicycles with detachable trailers. Depending on the business’ success, the project will be rolled out to neighbouring towns and provinces. This year’s sponsors included Kisch Attorneys and Bhive, the NWU’s Enterprise Development Centre. 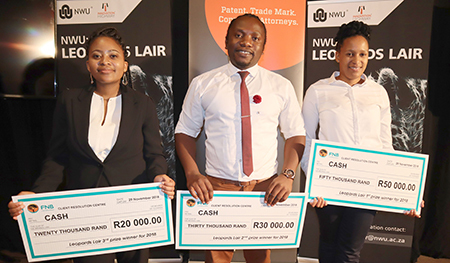 The three winners of the NWU’s Leopard’s Lair Competition are Olwethu Mvelo (second runner-up), Sydwell Sihlangu (runner-up) and Boitshepo Gopane (winner).